Grace offers the opportunity for adults to continue their religious worship and education on Sundays and at monthly meetings. The Adult Bible Class meets with Pastor at 9:15 am on Sunday mornings immediately following the 8:00 worship service. 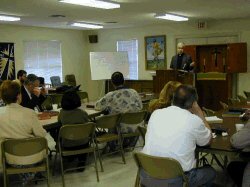 The class discusses the teachings of Christ in a friendly, relaxed atmosphere. The Adult Day Time Bible Study Discussion Group meets on the third Tuesday of each month to discuss topics of interest. The group meets at about 9:30 am for coffee and visiting with bible study from 10:00 to 11:00 am. Occasionally Pastor begins an Adult Inquirers' Class to study what the Lutheran Church believes. The class is available as a refresher course for members, and is also available to everyone who is not a communing member of the Lutheran Church that would like to know more about our faith. There is no obligation to join the church, but you may become a communing member after you have completed the classes if you wish.